Every Saturday from 9am – 1pm. We expect stallholders to set up at 9am, and ready to trade. Your vehicle is permitted to unload at your stall for a maximum of 20 minutes, after which time you may drive it to the parking area within the market grounds. A guide on where to go and what to do on arrival will be forwarded to stallholders prior to Market Day. Stallholders do not need to attend every week. We have set up a monthly roster to include once-a-month stallholders. At the Bondi Farmers Markets we welcome a number of food and fresh produce stallholders. Our priority is that the people who grow the product, sell it. However, in some cases due to customer demand we allow our producers to source goods from either a grower local to their own farm or via wholesale. If produce is being re-sold our producers are instructed to make the customer aware. Please note that all value-added products must be produced by the stallholder. We also require that the individual selling produce at the stall has a good knowledge of production methods, where the produce is grown, storage and cooking instructions. Stall Fees vary depending on the types of products you will be selling. Stall sizes may vary slightly but are generally 3.0m X 3.0m. Table Hire is $10.00 – 2.4m long x 0.76m wide x 0.74m high (we have a limited number of tables, ensure you let us know you will be needing one when you make your stall booking). Marquee Hire is $10.00 – 3.0m x 3.0m (please notify our office prior to the day of the market). Power is $10.00 for 10amp and an extra $20.00 for 15amp (high power users will be quoted special rates on application). All stallholders are required to trade out of a 3.0m x 3.0 metre WHITE marquee with a plain white roof and sandbag weights. As stated above, marquee hire is $10.00 per week. You are welcome to bring your own marquee if it meets the above requirements and is in good condition. Due to our storage restrictions, regular (weekly) stallholders will have to supply their own marquees and sandbag weights. Most stalls may trade from 3 sides of the marquee. As for additional equipment to bring, we recommend bringing chairs, display equipment and table covers. IMPORTANT: All hot food/ready-to-eat food stallholders must bring floor covers. These floor covers must cover the entire cooking and food prep area of your stall preferably 3.0m x 3.0m. Please ensure that liquids cannot leak through your floor covers. If you don't bring appropriate floor covers you will not be allowed to trade. Stallholders may also be asked to cover any costs inccurred as a result of cleaning their stall area. Please scroll down to submit an application to become a stallholder. If your application is successful and you have paid your stall fee, your stall allocation will be given to you upon arrival at the market. Bookings are not confirmed until your payment is made. Stall fees must be paid in advance and may be paid online. All stall fees must be received before Wednesday 5pm of the week that you have made a booking for. If payment is not received before this time your booking may be cancelled. In accordance with Bondi Farmers Market Policy all bags must be made of biodegradable or recycled materials. Plastic bags are not accepted and traders that are using them will be asked to remove them. If you make a booking request and subsequently do not cancel or make a payment by Wednesday 5pm then your stall fee will remain outstanding. Further booking requests will be declined until outstanding monies have been cleared. If bookings are cancelled before Wednesday 5pm prior to Market Day, stall fees may be credited to another week. Stall fees are not refundable. All hot food stallholders must have in place their own public and product liability policy providing a minimum of $10 million cover. All other stallholders must have in place a public liability policy providing a minimum of $5 million cover. We are not qualified to recommend or provide advice on the most appropriate policy but note that there are a number of companies who offer quick insurance cover for stallholders including: www.stallinsure.com.au, www.netinsure.com.au, www.aami.com.au, www.tradersvoice.com.au, and cityrural.net.au. You should make your own enquiries as to which insurer is best for your requirements. What Terms & Conditions Apply? All stallholders are granted consent to trade at the market on the condition that they agree to the terms and conditions of the Market Regulations by forwarding a completed application form to the Market Manager online or by post. You must agree to the Market Regulations if you wish to trade at the markets. Please scroll down to begin your application and view our Market Regulations. Board? 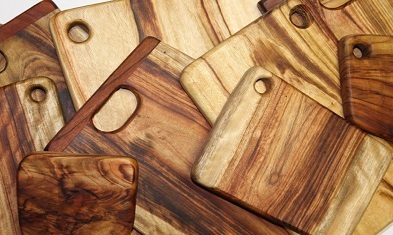 Come check out Byron Bay Chopping Boards.